Group 16 (VIA) consist of oxygen, sulphur, selenium, tellurium, and polonium. They are often referred to as the chalcogens and their compounds as the chalcogenides, although these names are seldom applied to oxygen and its many compounds. Oxygen, sulphur, and selenium are non-metals. Tellurium is a metalloid and polonium is a metal. Group 16 elements have 6 valence electrons, meaning that they require two more electrons to complete a stable electron octet. They still have relatively large electron affinities and are rather reactive, forming ions with a -2 charge. All form volatile compounds with hydrogen: water H2O, hydrogen sulphide H2S, hydrogen selenide H2Se, hydrogen telluride H2Te, and polonium hydride PoH2. Electronegativity decreases in this group with increasing atomic mass, and oxygen is more electronegative than any element except fluorine; it acts much like a halogen except for its -2 oxidation state. Fluorine and oxygen oxidize these elements (except oxygen) to the +6 oxidation state, resulting in such substances (for sulfur) as sulfur hexafluoride SF6 and sulfur trioxide SO3 and its derivative sulfuric acid H2SO4, one of the most heavily-used industrial chemicals. (Note that use of sulfuric acid requires extreme care because it causes chemical burns upon flesh, cloth, and paper). Typically, these elements will attain an oxidation state of -2. Oxides of sulfur, selenium, and tellurium are acidic. Strong radioactivity largely masks the chemical properties of polonium. The elements of Group 16 have somewhat varied properties; however, our study of these elements will focus on oxygen because of its abundance and significance. Oxygen is a diatomic gas that makes up about 20% of the air we breathe. It is essential for the life of animals, and plants release it. Plants absorb sunlight and produce glucose (sugar) and oxygen. Cells of plants and animals alike "burn" glucose with oxygen to gain energy. Photosynthesis is actually a series of complex chemical reactions, involving several substances found in the chloroplasts of plants. This is the overall reaction. Cellular respiration is the reverse process: converting glucose into energy. Oxygen has a few allotropes, but only two are common: dioxygen and ozone. Dioxygen is the regular form of oxygen, O2, held together with a double covalent bond. Ozone, O3, is found naturally in the upper atmosphere and can form when normal oxygen is exposed to high voltage. If oxygen is chilled to about -183 C (also about -297 F) oxygen condenses as a blue liquid that strongly concentrates oxygen as an oxidizer, something that allows fuel to burn. Liquid oxygen is used in rockets for use in space flight to allow the rockets to go into space where there is practically no oxygen gas. Ozone is not very stable. It will decompose: 2 O3 → 3 O2. Ozone is a very powerful oxidizing agent. Metals and non-metals are both susceptible to oxidation when exposed to ozone. Carbon is oxidized by ozone. Nitric oxide becomes nitrogen dioxide. High-powered radiation from the sun splits ozone molecules. Atomic oxygen can reattach itself to dioxygen to recreate ozone. You can see that the net result of the above reactions is a system of ozone that converts dangerous radiation into heat energy. The amount of ozone in the atmosphere is small, but solar radiation will split O2 into two O atoms, so there is a small but steady supply of ozone. Unfortunately, many man-made products called chlorofluorocarbons (CFCs) have entered the upper atmosphere over the years. The chemicals release chlorine radicals that act as catalysts for an ozone-destroying reaction. As a result, the amount of ozone in the atmosphere has decreased, which could lead to an increase in dangerous solar radiation. A chlorine radical forms from a CFC. Radicals have a single non-bonding electron (instead of the usual pair), so they are extremely reactive. A chlorine radical is simply a single atom of chlorine (which has seven electrons). Chlorine radicals will become stable by "stealing" an oxygen atom from ozone. The chlorine monoxide reacts to eliminate another ozone molecule. The original radical is now available to repeat the entire process. As you can see, chlorine radicals convert ozone into regular oxygen without being used up. Over the years, products have been created that replace CFCs and cause less environmental damage. Any chemical compound consisting of oxygen and some other element covalently bonded is an oxide. Metals form oxides easily, except for a few including gold, platinum, and mercury. Besides being called oxidation, the process is also called tarnishing or rusting. In other words, an iron nail that turns to rust has formed iron oxide. The dull, dirty-looking film that coats otherwise shiny copper is copper oxide. Oxides form because oxygen is so electronegative. When substances burn (including hydrocarbons and metals), they oxidize and release large amounts of heat quickly. The oxide ion is O2-. There is also peroxide O22- and superoxide O2-. 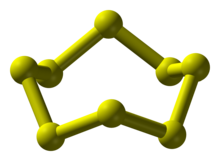 Sulfur behaves similarly to oxygen, but it has over 30 allotropes. The most common is S8. Sulfur is a yellow solid at ambient conditions. Sulfur is a part of many organic and inorganic compounds. Sulfur is part of some proteins necessary for life. Sulfur in a -2 oxidation state forms compounds known as sulfides with many metals, e.g. K2S CaS, FeS, PtS2. Some of those (notably the alkali metal ones) are soluble, others like CuS extremely insoluble in water. Other oxidation states are also possible, e.g. in pyrite FeS2 the oxidation state is -1 and sulfur occurs as a disulfide anion S22- with a covalent S-S bond, comparable to the O-O bond in peroxide. Other intermediary oxidation states do occur but are less common. Chemical names beginning with "thio"- mean an oxygen atom has been replaced with a sulfur atom. For example, cyanate is OCN-, whereas thiocyanate is SCN-. Similarly PS43- is the thiophosphate ion. Selenium conducts electricity better in the light than in the dark, so it is found in photocells, electrical components that detect light. The chemistry of tellurium differs a bit more from that of sulfur. Compounds like H2Se and H2Te are exceedingly foul smelling gases and very poisonous. Both elements are used in the formation of semiconductors. Some selenides and tellurides occur as minerals. The name Telluride is best known as a ski resort in the mountains of Colorado but it owes its name to the occurrence of a black telluride mineral that was initially not even recognized as a valuable gold ore. Interestingly gold shows an counter-intuitive stability in its reactions with elements of this group: the telluride is the most stable one, gold selenides do exist, but the sulfide and the oxide are metastable. Polonium is dangerously radioactive and very rare. It is usually associated with uranium ore as a product of radioactive decay of uranium. It gained some notoriety as a poison administered to a Russian spy.